Labor, big business, and the forgotten lessons of a disaster that happened 100 years ago this month. Americans tend to be fascinated by what’s new and to be indifferent to the past, except when they can use “tradition” to reinforce current prejudices and power arrangements. This has had an unfortunate effect on how we govern ourselves. We forget important lessons, and repeat old mistakes. Businesses today, and their allies in Congress and the statehouses, are making the same arguments against government regulation that New York’s business leaders made a century ago. The current hue and cry about “burdensome government regulations” that stifle job growth shows that the lesson of the Triangle has been forgotten. Here, to refresh our fading memories, is what happened. One hundred years ago, New York was a city of enormous wealth and wide disparities between rich and poor. New industries were booming—none more so than women’s and men’s clothing. The new age had created a demand for off-the-rack, mass-produced clothing that could be sold in department stores. The Triangle company made blouses, which were called shirtwaists. Few of those who bought the new ready-to-wear clothing gave much thought to the people who made them. The blouses, skirts, and sweaters were sewn in miserable factories, often by girls as young as 15 who worked seven days a week, from 7 a.m. to 8 p.m. with a half-hour lunch break, and often longer during the busy season. They were paid about $6 per week, and were often required to use their own needles, thread, irons, and even sewing machines. The factories were overcrowded (they often occupied a room in a tenement apartment) and lacked ventilation. Many were poorly lit fire traps without sprinklers or fire escapes. In November 1909, over 20,000 shirtwaist makers from more than 500 factories, led by the International Ladies Garment Workers Union (ILGWU), walked off their jobs. They demanded a 20 percent pay raise, a 52-hour workweek, and extra pay for overtime. They also called for adequate fire escapes and open doors from the factories to the street. Within 48 hours, more than 70 of the smaller factories agreed to the union’s demands, but many of the largest manufacturers refused to compromise. The New York City police soon began arresting strikers—labeling some of them “street walkers,” which was literally true, since they were carrying picket signs up and down the sidewalks. Judges fined them and sentenced some of the activists to labor camps. But the strikers held out and by February 1910, most of the small and midsized factories, and some of the larger employers, had negotiated a settlement for higher pay and shorter hours. One of the companies that refused to settle was the Triangle Waist Company, one of New York’s largest garment makers. That July, another group of garment workers—over 60,000 cloakmakers, mostly men this time—went on strike. As the tensions escalated, both union and business leaders invited prominent Boston attorney (and later Supreme Court Justice) Louis Brandeis to New York to help mediate the conflict. With Brandeis’s nudging, the two sides signed the “Protocol of Peace” agreement that set minimum industry standards on wages, hours, piece-rates, and workplace safety and health. But the Protocol’s weakness was that it was a voluntary agreement, not a government regulation, and not all manufacturers signed on. Once again, one of the holdouts was the Triangle Waist Company. Owned by Isaac Harris and Max Blanck, who were known as the “the shirtwaist kings," Triangle was one of the most rabidly anti-union firms. 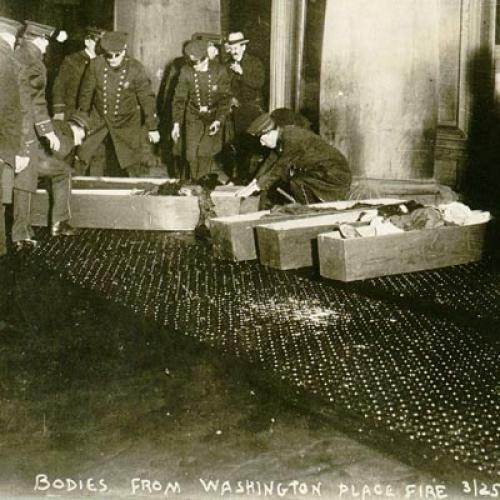 On March 25, 1911, on a Saturday at 4:45 p.m., close to quitting time, a fire broke out on the eighth and ninth floors of its ten-story building. Factory foremen had locked the exit doors to keep out union organizers and to keep workers from taking breaks and stealing scraps of fabric. Other doors only opened inward and were blocked by the stampede of workers struggling to escape. The ladders of the city’s fire engines could not reach high enough to save the employees. As a result, workers burned or they jumped to their deaths. Experts later concluded that the fire was likely caused by a cigarette dropped on a pile of “cut aways” or scraps of cloth that had been accumulating for almost three months. News of the fire spread quickly, catalyzing public opinion, and energizing a broad coalition of unlikely allies. It included immigrants, muckraking journalists, clergy, unionists, socialites, and socialists. Rose Schneiderman, an immigrant worker, socialist, and fiery union organizer, found common cause with Anne Morgan, the daughter of Wall Street chieftain J.P. Morgan. Frances Perkins, a former settlement house worker who was at the time a researcher and lobbyist for the Consumers League (and who later became Franklin Roosevelt’s trailblazing secretary of labor) joined hands with Rabbi Stephen S. Wise to demand reform. On April 6, 30,000 New Yorkers marched—and hundreds of thousands more lined the march’s route—behind empty hearses to memorialize the fire’s victims. Numerous rallies, broadsides and editorials called for legislative action—ranging from fire safety codes to restrictions on child labor. In response to the outcry, New York Governor John Alden Dix created the Factory Investigating Commission, a pioneering body with broad subpoena powers and teams of investigators, led by two savvy Democratic politicians, state Assemblyman Al Smith and state Senator Robert F. Wagner. Smith, Wagner, and the Commission members traveled up and down the state holding hearings and visiting factories. Over two years, the commissioners interviewed almost 500 witnesses and visited over 3,000 factories in 20 industries. They found buildings without fire escapes, bakeries in poorly ventilated cellars with rat droppings. Only 21 percent of the bakeries even had bathrooms, and most of them were unsanitary. Children—some as young as five years old—were toiling in dangerous canning factories. Women and girls were working 18-hour days. After the fire, many city officials acknowledged there was a problem. Edward F. Croker, New York City’s retired fire chief, told the Commission that employers “pay absolutely no attention to the fire hazard or to the protection of the employees in these buildings. That is their last consideration.” His department had cited the Triangle building for lack of fire escapes just one week before the fire. But the garment manufacturers, the Real Estate Board, and the bakery and cannery industry groups sought to stymie the Commission. The real-estate interests opposed city fire codes. After the Fire Department ordered warehouses to install sprinklers, the Protective League of Property Owners held a meeting to denounce the mandate, angrily charging the city with forcing owners to use “cumbersome and costly” equipment. As representative of the Associated Industries of New York insisted that regulations would mean “the wiping out of industry in this state.” Mabel Clark, vice president of the W.N. Clark Company, a canning corporation, opposed any restrictions on child labor. “I have seen children working in factories, and I have seen them working at home, and they were perfectly happy,” she declared. Smith, Wagner, and the political leaders of the time, fortified by a vibrant progressive movement, ignored these opponents of business regulation. In the first year, the Commission proposed and the legislature quickly passed a package of laws requiring mandatory fire drills, automatic sprinklers, and unlocked doors during work hours that were required to swing outward. They also created rules on the storage and disposal of flammable waste, and they banned smoking from the shop floor. In the second year, the legislature passed additional reforms. They set the maximum numbers of workers per floor. They established codes requiring new buildings to include fireproof stairways and fire escapes. They required employers to provide clean drinking water, washrooms and toilets for their employees. They gave labor commission inspectors the power to shut down unsanitary tenement sweatshops. And they ruled that women could work no more than 54 hours a week and that children under 18 could not work in dangerous situations. These pathbreaking state regulations, provoked by the Triangle fire, proved that government could play a powerful role in the lives of ordinary people. Other states followed suit, and ultimately President Franklin Roosevelt, prodded by Perkins, Wagner, and other veterans of New York’s progressive movement, introduced New Deal reforms ending child labor, establishing a federal minimum wage and a 40-hour week, and creating a National Labor Relations Board (NLRB) that would establish the right of workers to form a union that would bargain collectively with employers. The Triangle company’s owners were indicted and went on trial for manslaughter, but they were found innocent when the judge told the jury that in order to return a guilty verdict, they had to find that the two defendants knew or should have known that the doors were locked. Harris and Blanck also continued to refuse to recognize the union. But the company never recovered from the fire and the controversy surrounding it, and in 1918, it closed its doors. That didn’t happen to other city businesses. Contrary to the business leaders’ dire predictions, they did not suffer from the new regulations. The New York Times reported in July 1914, that, “[n]otwithstanding all the talk of a probable exodus of manufacturing interests, the commission has not found a single case of a manufacturer intending to leave the State because of the enforcement of the factory laws.” New York’s Seventh Avenue remained the headquarters of the nation’s garment industry for decades until production gradually moved south and overseas after World War II. Ironically, 100 years after the Triangle fire, we still hear much of the same rhetoric whenever reformers seek to use government to businesses act more responsibly and protect consumers, workers, and the environment. For example, the disasters last year that killed 29 miners at Upper Big Branch and eleven oil rig workers in the Gulf could have been avoided had lawmakers resisted lobbying by mine owners and BP to weaken safety regulations. Today, the leading foe of reform is the United States Chamber of Commerce, which is on a crusade against the Obama administration’s plans to set new rules on unsafe workplaces, industrial hazards and threats to public health. The Chamber labels every effort at reform a “job killer.” The Chamber’s most vocal proponent is Darrell Issa, the conservative California Republican who chairs the House Committee on Oversight and Government Reform. At the request of the Chamber and other industry lobbies, Issa recently launched a congressional assault on safeguards in workplaces and communities. In January, Issa sent letters to more than 170 companies and business lobby groups—including Duke Energy, FMC Corp., Toyota, Bayer, the American Petroleum Institute, the National Association of Manufacturers, the Association of American Railroads, the National Petrochemical & Refiners Association, and lobbies representing health care, banking, and telecommunication providers—asking them to identify "burdensome government regulations" that they want eliminated. The business groups responded with a long wish list, including rules to control “combustible dust” that has resulted in explosions killing workers; rules to track musculoskelal disorders, such as tendonitis, carpal tunnel, or back injuries, that impact millions of workers at keyboards, in construction, or in meat processing; and rules to address workplace noise that leads to hearing loss. And Republicans listened. They are proposing to cut OSHA’s budget by 20 percent, which, coming on top of decades of cuts, would cripple an agency that has been effective at significantly reducing workplace injuries and deaths. The Republican leadership is trying to drive home the message, in Speaker John Boehner’s words, that “excessive regulation costs jobs” and that the “path to prosperity” is by “getting government out of the way.” Americans of earlier generations—who enjoyed the benefits of the Progressive Era and the New Deal reforms, and the political clout of a vibrant labor movement—understood this was nonsense, but it seems like the lessons of the past have to be relearned again. That’s why it is important to recall the sordid circumstances in which 146 young women lost their lives at the Triangle Waist Company a century ago. Peter Dreier teaches politics and chairs the Urban & Environmental Policy Department at Occidental College. His next book, The 100 Greatest Americans of the 20th Century, will be published later this year by Nation Books. Donald Cohen directs the Cry Wolf Project.